In 1984 I graduated from Arizona State University with a degree in Clothing and Textiles. I spent time in the work force both before and after graduating. In 2001 I retired to pursue the art of metal smithing. I began to design and fabricate one of a kind art jewelry. 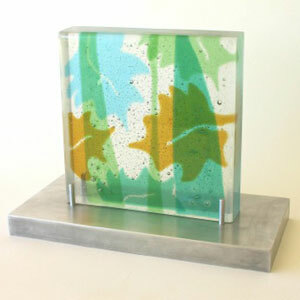 In 2004 I was introduced to glass fusing by Dr. Gail Jamieson, who is currently teaching glass fusing at Phoenix College. I was immediately captivated by the medium. I am inspired by the colors of glass that are available to work with as well as, the textures that can be achieved in kiln formed glass. I am especially drawn to working thick and casting techniques, like Pate de Verre. In a previous life I made clothing. That is where I learned my love for texture and color. I have carried that love into glass and metal. 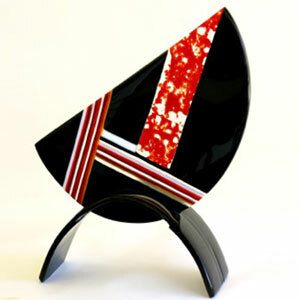 My inspiration is found not only in nature, line and form but from the mediums themselves. I believe that we all have a fundamental desire to create, to express ourselves. I have chosen glass and metal for that purpose. I continue to educate myself in these mediums and learn new ways to express myself.